Minecraft Quilt #1 - Finished! Ooh man, this is a good one. 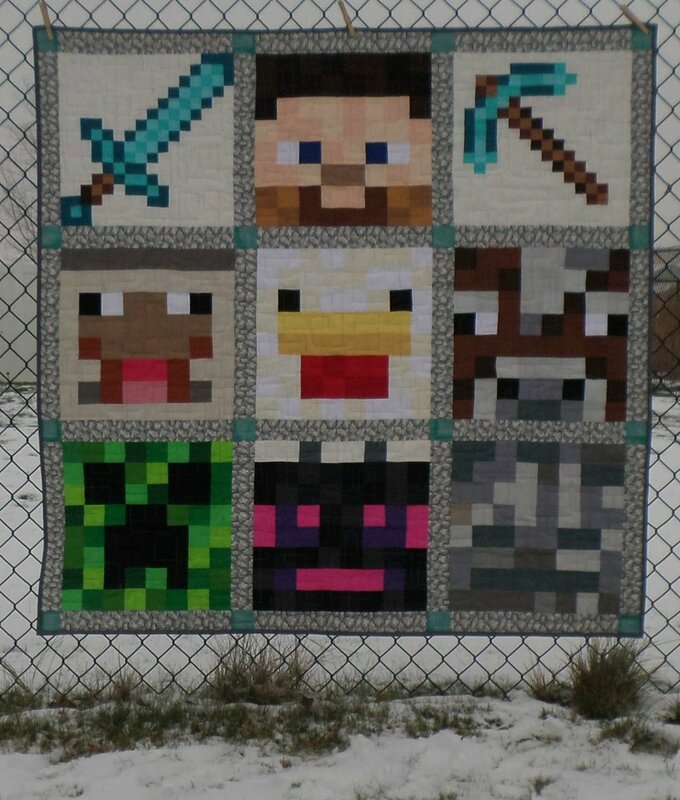 My parents' neighbor has a nine year old grandson, and she ordered a Minecraft quilt for him for Hanukkah. And don't even get me started on how long it took him to pick the sashing and cornerstones from Spoonflower. There is apparently a HUGE difference between stone and cobblestone. Unluckily for me, my husband is off on an adventure with my good camera, so I was stuck with the Dude's little point-and-shoot. Which has a cracked screen, so I was mostly guessing on whether the pictures came out. So ignore the spots and exposure issues. I'm really quite happy with the sword and axe - they use 1.5" unfinished pieces. Everything else was 2.5". The patterns either came from Fandom in Stitches or just Googling "Minecraft skeleton face." Since it's an 8-bit game, most everything fits nicely into 16" blocks. The backing is Joann's flannel, the binding is Kona Coal. Oh, and the fabric is all solids, obviously, a mix of a Kona order and scraps which may be Kona but not all Kona. Please don't ask me the colors. There's a LOT of colors! Quilting is an all-over boxy stipple. Oh so nicely labeled and not filled out! Seriously with the Spoonflower sashing and such, though. It's not currently available, so I'm very glad I scored it! It's the perfect touch to this. Even though it's cobblestone. And to thank the Dude for all his assistance in choosing blocks and fabrics, I'm finishing up his own sixteen block version. Before Christmas. Maybe. Eek!